Kush Abadey is a 15-year-old drummer, composer, and Artist-in-Residence at Strathmore. Auditorium. Kush performed with the Tootsie Gripper Ensemble in aAt only 15 years old, Kush Abadey is an accomplished drummer & bandleader. A sophomore at Suitland Senior High School in the Visual and Performing Arts Contextual Learning Program in Forestville, MD. He is a piano major, and a member of both the Concert Choir, and the Jazz Band. Kush opened the All-Star concert in celebration of Duke Wellington's birthday at the Lincoln Theatre and performed at a tribute for Dr. Billy Taylor at the Mellon nd around the Washington metropolitan area. In July 2005 Kush led a jazz quartet at the Public Playhouse in Cheverly, MD, in a program entitled “Jazz on a Sunday Afternoon” for an educational fundraiser. 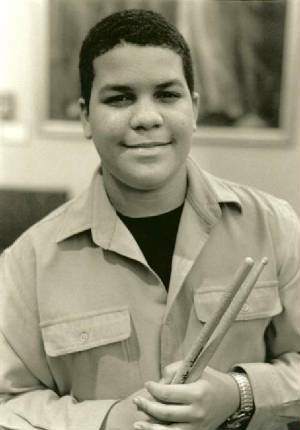 Kush studied piano with Harlan Jones at the New Sewell Music Academy, and soon afterwards began playing percussion in the Fred Foss Jazz Youth Orchestra. He also studied jazz improvisation with Jeffrey Chappelle and percussion with Tom Teasley at the Levine School of Music. Kush has been a recipient of the Laurel Fund, where he has performed various community service projects taking the music to those who don't necessarily have the opportunity to go to live concerts. Kush has a tremendous passion for music, especially African American Classical music, more known as Jazz. His desire is to be a professional musician, composer, arranger and producer in the future. performed at the Strathmore Music Center in Bethesda, MD. Noble Jolley, Jr., is a sophomore at Peabody Conservatory of the Johns Hopkins University majoring in Jazz Studies/Performance. Noble was nominated to the 2005/2006 National Dean's List, and the 2004/2005 Who's Who Among America's High School Students. He currently performs with the Peabody Conservatory Jazz Band and the Washington Jazz Arts Institute Orchestra. A home schooled student, Noble was a guest member of the Howard University Jazz Orchestra in his senior year in high school. Noble has performed at the 2006 International Association of Jazz Educators Conference, 2000 Havana Jazz Festival in Havana, Cuba with the Fred Foss Youth Orchestra, the East Coast Jazz Festival, American University Blues & Jazz Festival, Maryland Youth Jazz Festival, the Kennedy Center, Lincoln Theater, Blues Alley, Blue Note, and Zanzibar Blue. He has performed with his father, the late Noble Jolley, Sr., jazz guitarist, Gary Thomas, Davey Yarborough, Esther Williams, Heidi Martin, Dr. William Smith, and has opened for James Moody and Ron Carter, and many others. A composer, producer, songwriter and arranger, Noble, Jr. and performs with his twin brother, jazz percussionist Nathan Jolley. Noble, Jr. has studied with Tim Murphy, Janelle Gill, and Jon Ozment.